Philip (not Eric’s real name) was starting his morning ride. As he hit the little bump at the end of his driveway, his handlebars rotated loosely downward. I wasn’t there, but I imagine that as he thought he was about to do an up-close inspection of the ground around his front tire he said “Oh, shoot” or something like that. The faceplate on his handlebar stem had failed. Note: This is not carbon fiber. It is a faux carbon paint effect on an aluminum faceplate. Separation of the paint from the aluminum under it may have contributed to the corrosion. Read on. 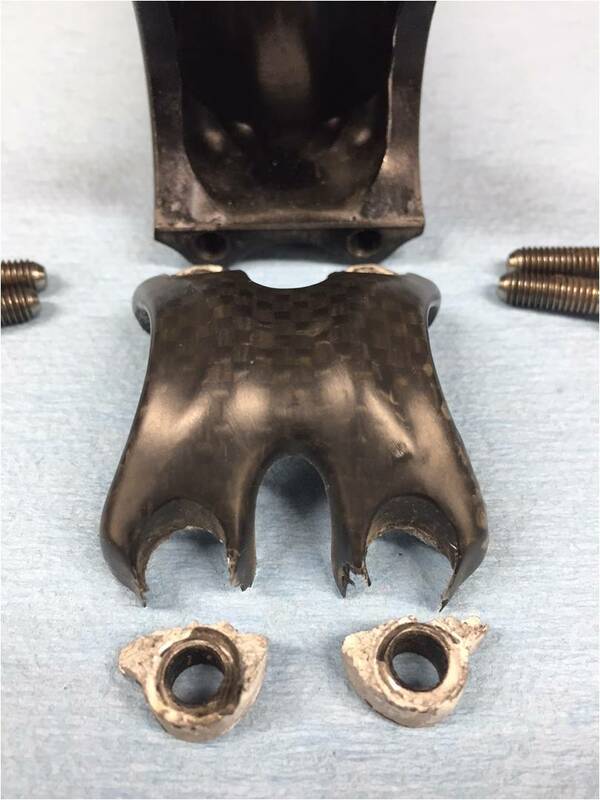 Fortunately the faceplate structure and the remaining two bolts, while insufficient to prevent rotation, did prevent total and immediate separation of his bars from his stem, allowing him to maintain control. Yes? Interestingly that’s not salt, though its presence is due to the presence of the chloride in your sweat. It is aluminum hydroxide, produced by crevice corrosion, as described in this article on Corrosion of Aluminum and Its Alloys: Forms of Corrosion and a slew of other scholarly articles on the topic. The aluminum in the aluminum hydroxide came from your stem, and it is a sign of deterioration in a critical high-stress area. 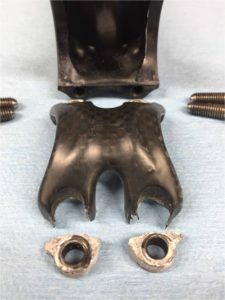 Sweat drips off your chin onto the stem (especially if you ride hunched over areobars or on a stationary trainer), gets in the crevices around the bolts, and creates a reaction cell, which strips aluminum from your stem faceplate to generate the aluminum hydroxide. A couple of other nasty places for crevice corrosion are under your handlebar tape and at the rear brake cable stop on your top tube. I don’t know why, but some people really do seem to have more corrosive sweat. Maybe it’s got to do with pH, or salinity, or some organic components. Don’t send me samples of your sweat. I’m really not that interested. Sometimes I apply a thick anti-oxidant paste made for use on aluminum house wiring to prevent this form of corrosion. And Now a Totally Tangential Esoteric Observation: Aluminum loves to oxidize! Aluminum is generally corrosion-resistant. This is because aluminum oxide forms a hard smooth protective film on the surface of otherwise unprotected aluminum. Aluminum oxide is so passive because it exists in a low energy state. It’s in this low energy state because aluminum gives up lots of energy when combined with oxygen. Aluminum is in fact a common ingredient in solid rocket propellant. Thermite is another widely used fun and practical application of aluminum oxidation. Powdered aluminum and powdered iron oxide (plain old rust) are mixed together. Something pretty hot, like a fireworks sparkler, is applied to get the reaction kicked off, and all the oxygen moves from the iron to the aluminum. It doesn’t explode. It just burns vigorously. The reaction is so exothermic that the mixture becomes molten! The heavier iron sinks to the bottom, while the lighter aluminum oxide floats to the top. The process is handy for esoteric jobs like welding railroad rails together and rendering cannons unusable before capture by an enemy. Oh, and The Mythbusters do a really good episode where they use thermite in an attempt to cut a car in half.